When Bonnie welcomed 18-month old Christopher into her life as her adopted son, the little boy with Down syndrome immediately stole her heart. Outgoing and talkative, Christopher thrived, thanks to the love and support of his mother. He enjoyed going to school, participating in sports, and listening to music. Unfortunately for Christopher, everything would soon become drastically different from the comfortable, familiar world he knew. At age 16, unexplained leg pain led to numerous medical tests, and finally to a diagnosis of blood clots in his legs, a condition known as deep vein thrombosis (DVT). Christopher experienced a serious side effect when the clot dislodged and traveled to his lungs, causing a pulmonary embolism. This blockage in the main artery of the lungs, forced Christopher, a young, active teen, into a hospital bed, fighting for his life. It would take months and months of hospital care before Christopher received the green light to finally come home. To help him breathe, physicians made an incision on the anterior aspect of the neck, opening a direct airway through an incision in the trachea. Then, a tracheostomy tube was inserted, allowing Christopher to breathe without the use of his nose or mouth. Christopher also became dependent on a ventilator, a machine used to move air in and out of a person's lungs. 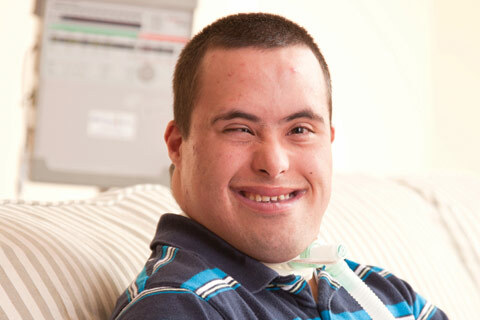 Once Christopher returned to the comfort of home, he required nurses who were specially trained in caring for patients with a tracheostomy and ventilator. That's when BAYADA became a part of the family. “ When Christopher first came home from the hospital, he began to panic during trach changes. Even after we gave him medication to help calm him down, he was oppositional and combative,” shared Bonnie. With each trach change, Christopher would fight, thrash, and nearly pass out, jeopardizing his life and nearly endangering his caregivers. This daunting situation motivated Christopher's nurse, Marjorie Smith-Gale, to find a creative solution to help Chris understand what was happening to him. Day after day, through patient perseverance, Marjorie, who has over 15 years of pediatric nursing experience with BAYADA, showed Chris how to change a tracheostomy using a child-size training doll. Now, it goes smoothly taking less than a minute, thanks to Marjorie's patience, understanding, and unique ability to emotionally connect with a hesitant teen, helping him work through his fear. In the process, she helped him become an active, helpful participant in many aspects of his life. Marjorie's compassionate nature created life-enhancing experiences for Christopher. To make his prom memorable, Marjorie went above and beyond by dressing him in a suit, providing flowers, and instructing him on how to wear the corsage. Bonnie feels a gratitude beyond words for Marjorie and her life changing contributions to her son's care. “Chris is successful, strong, and comfortable because of everything Marjorie has done,” she said. Bonnie sent a heartfelt letter of thanks to her local BAYADA office to express her appreciation for Marjorie. In response, Marjorie's colleagues nominated her as a National Hero, in recognition for her remarkable care, compassion, and exceptional skill. Her story traveled throughout the company, and one year later, she was standing on stage in front of thousands of people during the BAYADA annual Awards Weekend in Washington, DC, being honored as the Registered Nurse Hero of the Year. During her tenure with BAYADA, Marjorie has provided both adult and pediatric care. For parents, her presence in the home provides peace of mind and much-needed respite, and truly makes a difference in the lives of every child with physical and developmental challenges in her care.